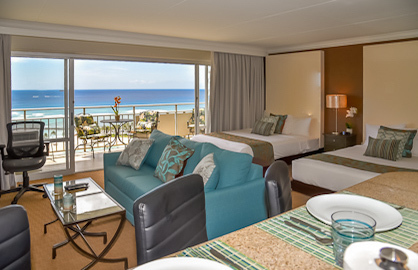 WaikikiBeachRentals.com - Quiet High Floor, Ocean and Lagoon View! As you walk in the door, you are immediately struck with the breathtaking views seen from every vantage point. 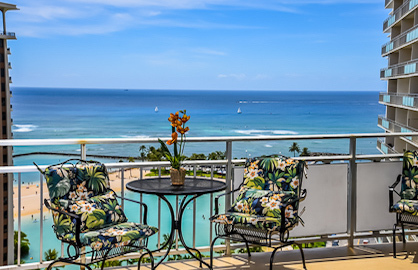 YOU are now in Waikiki and while sitting on your private lanai sipping your favorite Mai Tai, you can watch the surfers, the beautiful ocean and the Friday night fireworks show.... can life get better than this? This unit has 2 new queen size beds and a new queen sofabed that sleep five people comfortably. 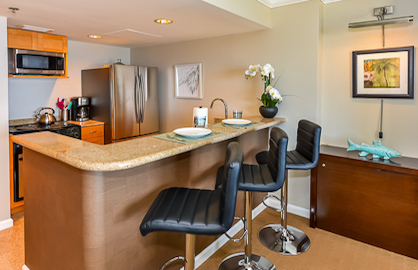 The granite kitchen with breakfast bar has new appliances: a large fridge, stove, and microwave, and most items to prepare your meals while on vacation. 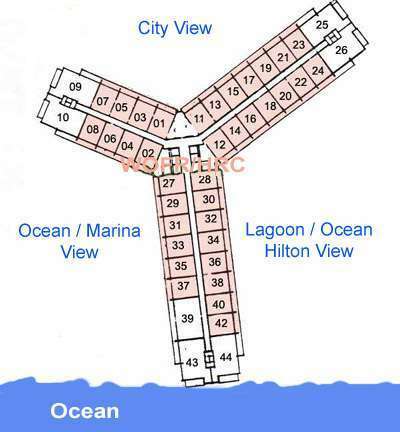 The 500sf condo has free internet and free calls to USA and Canada. This renovated condo has the glamor of a 5* hotel room but it's yours for a fraction of the price. This deluxe unit has a modern island feel and has been decorated with the highest quality materials. 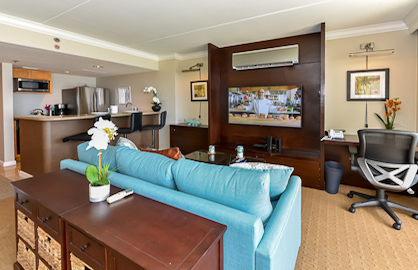 The spacious living area has a new 55" flat screen TV/DVD player and a internet work desk. So, if you want to eat out, or enjoy a relaxing meal from your own lanai....it's all about options. 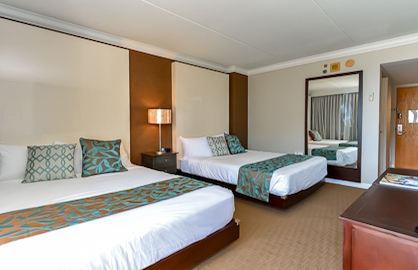 This quiet 19th floor condo is in a prime quiet location, adjacent to the Hilton Hawaiian Village and close to shopping by day at the Ala Moana Shopping Center, the convention center or the bustling night life of the Waikiki strip, you are close to it all. The lobby and property entry has the feeling of the Hawaiian Ohana (spirit). Steps away is Waikiki Beach and the Duke Kahanamoku Lagoon. See our all unit calendar to check. 129.00 30% to reserve dates. Remainder due 30 days before arrival. 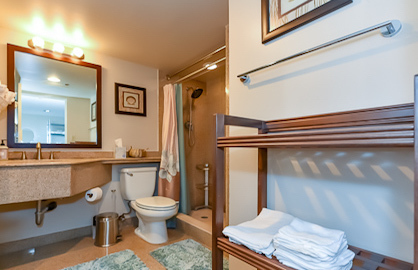 Ilikai 1914 - I was skeptical about booking this condo at first because there were no specific reviews for it. 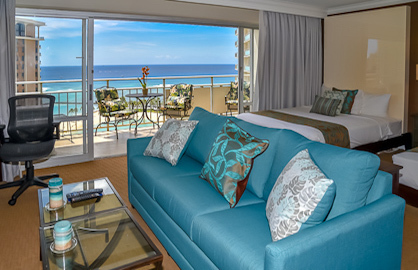 I am so glad that I made the decision to stay in this fantastic condo for our first Hawaiian vacation! The view is outstanding, the condo was clean, beds comfortable, and it had everything my husband and I needed. Check in is an absolute breeze. After a long flight all we had to do was punch in a code at the door and boom we are inside the condo. A very quick walk to the beach too! For the price it is truly unbeatable, the best value I could have found. The valet parking is very worth it and the building is beautiful. We loved going downstairs to Dave?s Ice Cream and eating several times at Cinnamons on property. The shop on the first floor is also very convenient and has everything you could need. We will definitely be back!